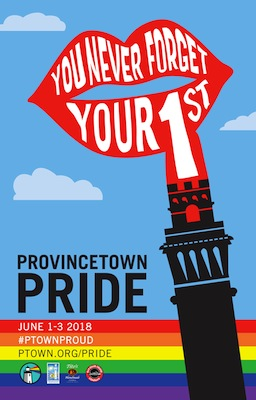 Provincetown is a favorite destination for LGBTQ travelers so it may come as a surprise to learn that June 1-3, 2018, Ptown will host its first Pride Festival. The Festival starts with “Official Pride Ferries” from Bay State Cruise Company leaving from Boston on Friday, June 1st and includes an assortment of events including (partial listing) of the following. art by artist Yvette Mattern commissioned by Provincetown Business Guild. Colored rays of laser light will be projected toward the sky, simulating a natural rainbow arc and expected to be visible for up to 20 miles. Saturday, June 2 at 4ish: 1st PRIDE Sashay to the Boatslip Tea. What would be more appropriate than making the walk down Commercial Street to the Boatslip Tea dance part of Ptown’s first Pride? Sunday, June 3 Underwear PRIDE Closing Party at Purgatory is the perfect way to close out the weekend celebration. There are obviously more events scheduled and you can read more about Provincetown’s first Pride festival by visiting ptown.org/pride.